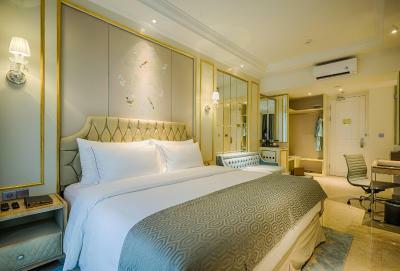 Lock in a great price for Art Deco Luxury Hotel & Residence – rated 8 by recent guests! The food! the food ! the food ! And the top floor view ! And the toiletries we're good of good quality ! View from roof top is great and so is the infinity pool. Hotel is small but have nice interior. Location was good. Roof top pool also impressive. breakfast was good. They had rooms with connecting door and the view from the swimming pool/resto @10th floor was so unforgetable. 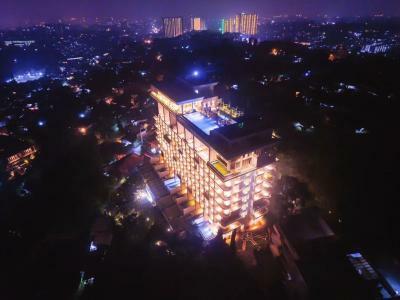 The style/design of the hotel are unique and looks luxurious also for the view of Bandung is beautiful from the rooftop. A great selection of breakfast menus and tastes good. The staffs and also the security guard are very friendly. 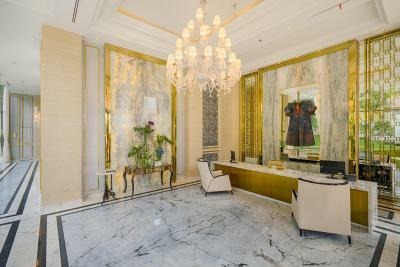 Art Deco Luxury Hotel & Residence This rating is a reflection of how the property compares to the industry standard when it comes to price, facilities and services available. It's based on a self-evaluation by the property. Use this rating to help choose your stay! 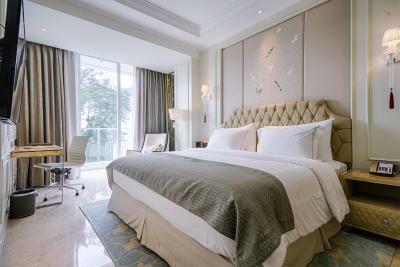 One of our top picks in Bandung.Set in Bandung in the West Java Region, 1.1 mi from Villa Isola, Art Deco Luxury Hotel & Residence features an outdoor pool and hot tub. Guests can enjoy the on-site bar. 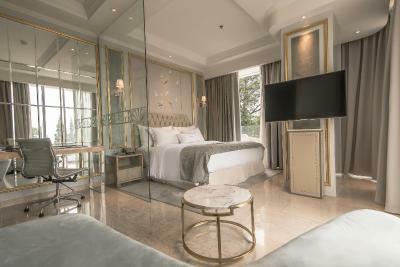 All rooms include a TV. 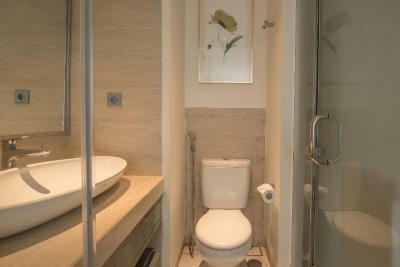 Rooms include a private bathroom. For your comfort, you will find bathrobes, slippers and free toiletries. 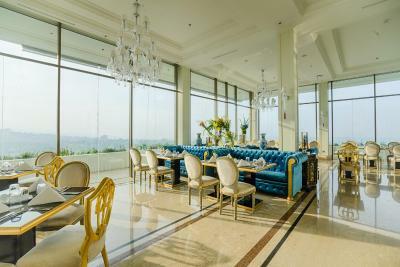 Cihampelas Walk is 1.7 mi from Art Deco Luxury Hotel & Residence, while Dago Pakar is 1.8 mi away. 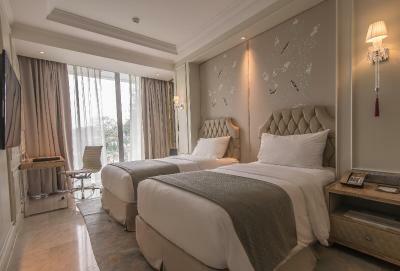 The nearest airport is Husein Sastranegara Airport, 3.1 mi from Art Deco Luxury Hotel & Residence. 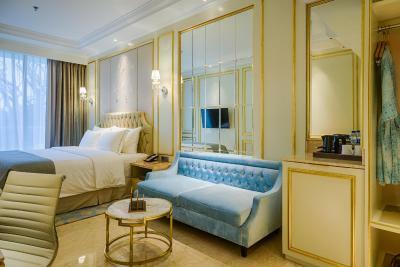 When would you like to stay at Art Deco Luxury Hotel & Residence? 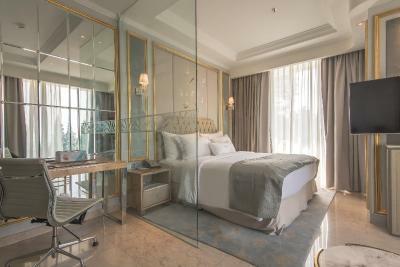 This 28-sqm room is fitted with a spacious wardrobe, a working desk, a reading chair and a safety deposit box. The private bathroom is fully stocked with premium toiletries. Guests enjoy complimentary newspaper, tea and coffee. 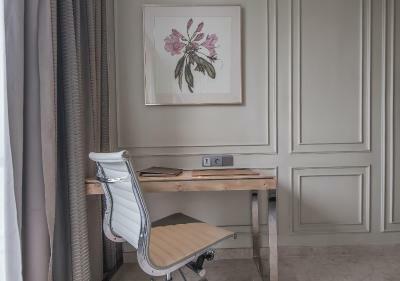 This 28-sqm room is fitted with a working desk, a reading chair and a safety deposit box. 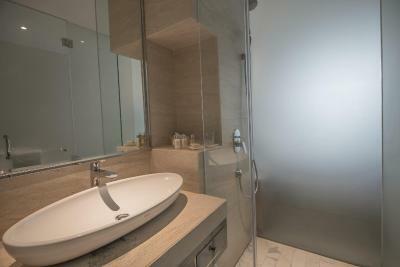 The private bathroom has a spacious wardrobe and is fully stocked with premium toiletries. Guests enjoy complimentary newspaper, tea and coffee. 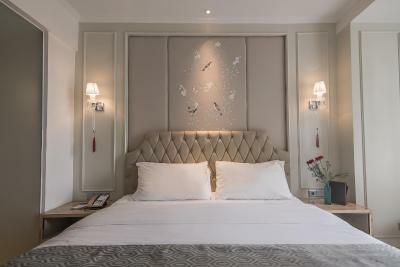 House Rules Art Deco Luxury Hotel & Residence takes special requests – add in the next step! Art Deco Luxury Hotel &amp; Residence accepts these cards and reserves the right to temporarily hold an amount prior to arrival. Art Deco Luxury Hotel & Residence accepts these cards and reserves the right to temporarily hold an amount prior to arrival. The cleanness of the bedroom needs to be improved! The carpet & curtain are worn out & dusty. The sofa cover is even ripped ☹️ The restaurant service is also very slow! 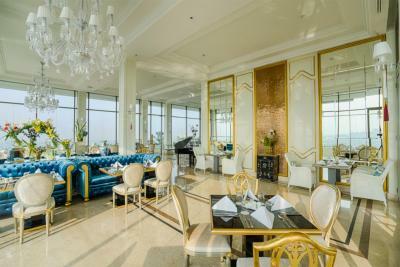 Breakfast buffet is also very standard for a hotel of its class. 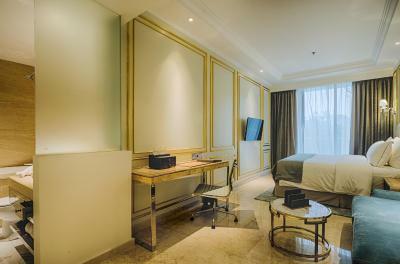 Location was too narrow and the room sizes could have been a bit bigger considering the competition in Bandung. I found so many ants in shower area, floor as well bench. Room service too slow. The design is very unique. Room was a bit old and worn out, the television didn't work out the first time we came and need to call for a technician. The viewfrom the room is very bad since the roomwas on level 2. All the higher levels for apartments. Under tbe bed is so dirty.looks like its never been cleaned for months. Toilet is extremly small. Not comfortabke at all. Floor around swimming pool is very slippery and dangrous. My wife and 4 other guests including guests fall down becaise if the slippery floor. Complained to staff but nothing happened. Its so obvious that the tiles are not anti-slippery tiles. Although the exterior looks good, the place was poorly maintained and lacking of clean facilities. Also, the room was leaking with aircon water. Room was really cramped. Carpet in my room looked dirty, kids pool looked dirty. Bath room was dirty, they don't clean it for long time, there were pink moldy wall. But the rest was really good. Super location, green, lush, quiet, close to some trendy places to eat & drink. small but stylish rooms. 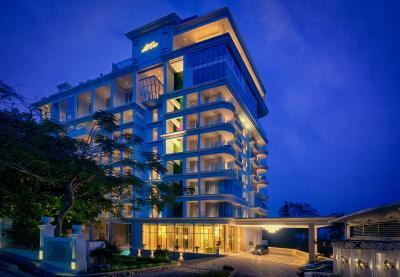 Whole hotel is stylish decorated, staff very friendly and helpful.